Veggies like cucumber, avocado, corn, tomato, spring union, carrot, etc. Fish like salmon, smoked salmon, shrimp, smoked eel, etc. Additions like crunchy nori, wakame salad, fried unions, coconut, etc. Dressings, where we always went for teriyaki. We had ordered there a couple of times, after which we moved to our new home. Seeing as they don’t deliver here (and we’re worried delivery on a recreational park won’t really work either way), hubby decided we should try making this ourselves. 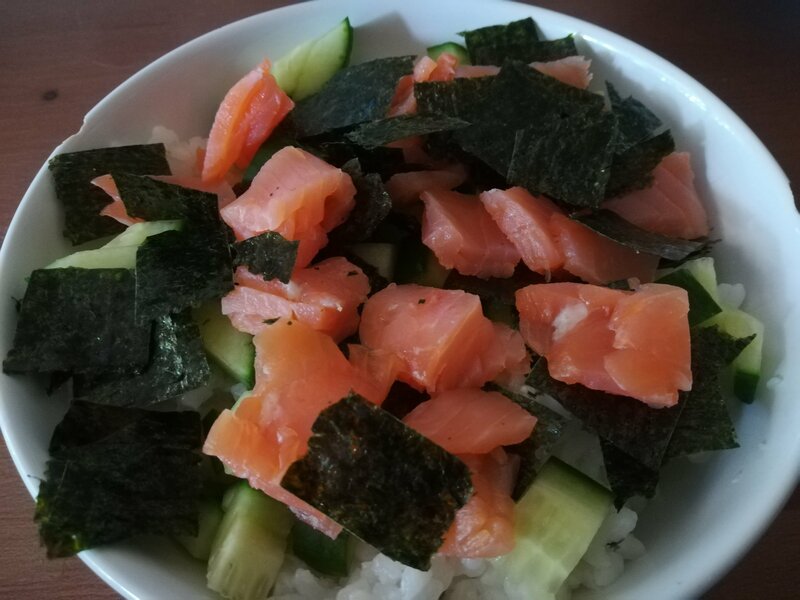 I liked that idea, because it’s so yummie and hey, creating it yourself is cheaper, even though the salmon is still expensive. So, when hubby was lying on the couch with a stomach ache, I headed over to the shop to buy the ingredients we wanted to use. 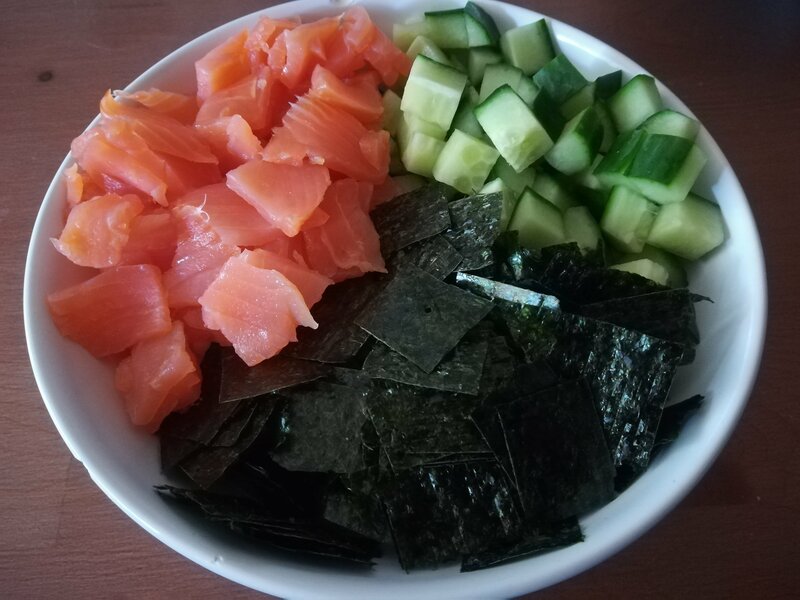 The day after, we tried making our own bowl! First, we cooked the rice. Way too late, seeing as it should have cooled off completely before actually starting the rest of the bowl. In this case, we couldn’t wait. Next, we cut everything into small pieces and filled up our bowl (rice on the bottom). It was a nice first try, though I was sad that both of the avocados I had bought were already brown on the inside, so we couldn’t use them. I think avocado would fit better than the cucumber did, but I’m glad I brought home the cucumber so it could take the avocado’s place. The ingredients ofcourse were delicious, but the rice was too boring. I didn’t have teriyaki or soy sauce! I’m sure it’ll be even better the next time we make this. Wash rice even better so it is less sticky. Cook rice sooner so it can cool off completely. Manage to find an avocado that’s not brown on the inside.